The X-Files is a game by Kevin Wilson, published by IDW Games. It is for 2-5 players. 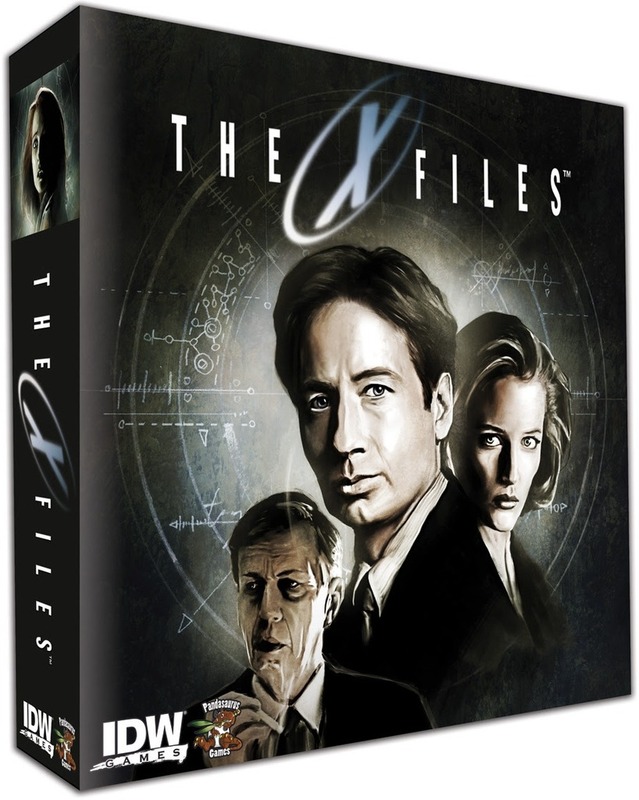 In this game, players take on the role of one of the 4 X-Files team members while another player plays the role of the Cigarette Smoking Man, a key agent for the Syndicate. The X-Files members will be working together to try to uncover evidence to close files before the Syndicate player buries the information forever. The person or team that accomplishes their goal first will be declared the winner(s). To begin, one player is chosen to be the Syndicate player while the rest are Agent players. The board is placed in the middle of the play area. The cards are separated into 2 stacks, one for each Agent, Syndicate and X-Files. The stacks are then shuffled and placed face down on their appropriate spaces on the board. Evidence tokens are placed inside the bag. Influence, progress and wound tokens, as well as the puzzle pieces are place in separate piles within reach of all players. The Agent and Syndicate token are placed on the appropriate tracker spaces on the board. 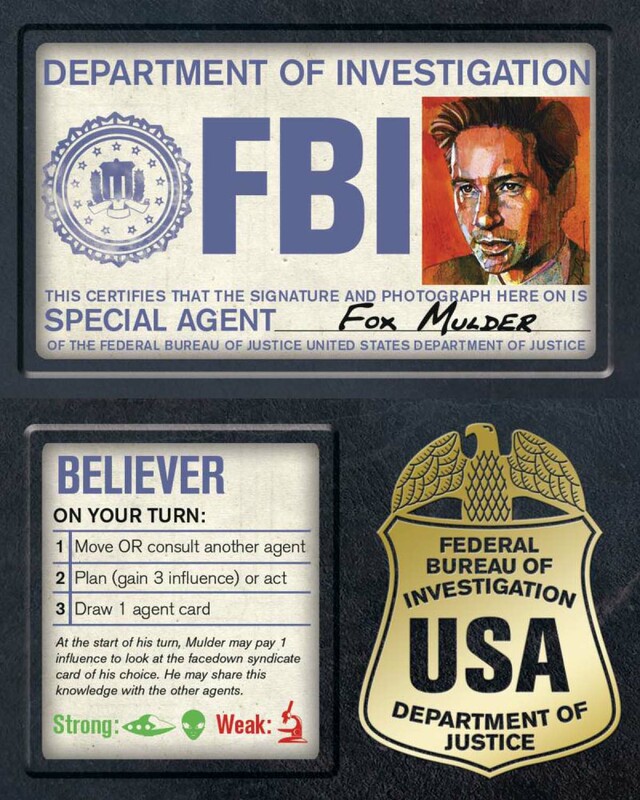 X-File cards equal to the number of Agent players are drawn and placed in the corresponding region on the board. If a card is drawn for an area that is already full, the card is discarded and a new one is drawn. Syndicate and Agent players will then perform their initial setups. The Syndicate player will take the Syndicate screen and the cigarette tokens, placing them behind the screen which is set up on the table in front of the player. They will then draw 5 Syndicate cards and collect influence tokens equal to the number of Agent players. The Syndicate player then places cards facedown on the board in the Syndicate spaces that are connected to each X-File space. Meanwhile, the Agent players will choose one of the 4 agents, receiving the corresponding credentials and pawn. The credentials are placed in front of the player while the pawn is placed in the Northeast region space on the board. Each Agent player then draws a hand of 5 agent cards and received 3 influence tokens. Play now begins, starting with the player to the Syndicate player’s left and continuing clockwise. The game is divided into Agents and Syndicate players turns. All Agent players will take their turn first before the Syndicate player takes theirs. Agents will perform three actions in order; move or consult another Agent, plan or act and replenish. The first step is to move or consult another Agent. To do this the player can choose one of the previous two actions. To move, a player chooses a region that is adjacent to the one that their pawn is at and moves it to the new area. This will allow the player to investigate an X-File in that area later. The other choice is to consult another Agent. To do this, the player chooses another Agent player that has a pawn in the same area as theirs is in. The players then give each other a card from their hand. They are allowed to show each other their hand before swapping cards. The next action for the Agent player is to plan or act. To plan, the Agent player simply collects 3 Influence tokens from the pile. If their Agent is wounded, they are allowed to heal wounds instead of receiving influence tokens. They can heal 1 wound for each influence token that they don’t take, up to 3 wounds. The other option an Agent player has is to act. This is done by playing a card from their hand. A card costs 1 influence to play. However each card has special skill icons that have to be referenced with the Agent’s credentials. If the Agent is strong in the skill it costs them 0 influence tokens. However if they are weak in the skill, it will cost 2 influence instead of 1. The card is then read aloud and it’s effects are carried out. The main reason to play cards is to investigate an X-File in the player’s region. The card will have the keyword “Investigate” in it’s text, followed by a number. The number is the amount of progress tokens that the Agent player will place on the X-Files card for that region. Once an X-File has a number of progress tokens equal to or greater than it’s difficulty, it is solved. The Agent player then draws tokens from the bag equal to the number on the card. Sometimes though, a cigarette token will be drawn thanks to actions from the Syndicate player. If one of these is drawn it is returned to the Syndicate player. The X-Files card is then turned facedown on it’s space. One other thing of note, if the X-File has a Syndicate card attached to it, the Syndicate player is allowed to reveal the card by paying influence tokens equal to the Syndicate card’s cost. The cards effect is then resolved usually affecting the Agent player in a negative way. One last thing about cards, there are Ally cards that are placed in the Ally space on the board. The effects of these cards remain in effect until another Ally card is played or revealed by the Syndicate player. The last action for the Agent player is to replenish. To do this, the player will draw 1 Agent card, adding it to their hand. Play then continues to the next player. Eventually play will progress to the Syndicate player. This player will follow a set of steps in order. The first step is to conceal evidence. This is done by drawing a token from the evidence bag for each unsolved X-File still on the map. Any evidence tokens are concealed behind the Syndicate screen. The progress tracker is updated on the board and a Cigarette token is then added to the bag, if the Syndicate player drew at least 1 evidence token. Any cigarette tokens that are drawn are returned back to the bag afterwards. The next step is to replenish X-Files. This is done when there are less X-Files cards on the board then there are Agent players. The Syndicate player then draws the correct number of X-Files cards and places them in their corresponding area. The third step for the Syndicate player is to refill their hand. This is done when the Syndicate player has less than 5 cards in their hand, otherwise this step is skipped. To do this, the player draws Syndicate cards until their hand has 5 cards in it. The next step is to collect influence. To do this, the Syndicate player takes a number of influence tokens equal to the number of players from the pile. The final step is to play Syndicate cards. To do this, the Syndicate player places any number of cards from their hand facedown onto the board in one of the Syndicate spaces attached to an X-File. The Syndicate player is also allowed to swap out a card on the board for one in their hand by paying 1 influence token. There are a couple more things that need to be pointed out. Each Agent has a special ability that is listed on the Agent’s credentials. These may be used whenever the player sees fit. When an Agent has the maximum of 5 wounds on their character, they don’t die. They simply must heal their wounds before they can take any more wounds. Of course to win the game, the Agent players must complete Mulder’s “I want to believe” puzzle. To form the puzzle, Agent players must spend evidence tokens equal to the number of Agent players to purchase a piece. In other words, in a game with 3 agents, a piece would cost 3 evidence tokens. This can be done at any time during a player’s turn. Once the puzzle is assembled the Agents win. However, the Syndicate player can win by concealing 25 pieces of evidence at any time during the game. Once this happens the Syndicate player reveals the concealed tokens and proves that they have won. Whichever player(s) that accomplish their goal first will win. This game has some very thematic and amazing looking pieces. The board has a very FBI/X-Files feel to it. Everything fits really well with the look and feel. The Agent credentials and Syndicate screen have some really great looking artwork. I especially like how the credentials look like an FBI badge. The Agent pawns are thick cardboard and have that artistic design that is ripped from the pages of the comics. The same is true of all the different cards. The artwork on them is really great looking and has that distinct comic book feel but has the creepy coolness of the X-Files. The tokens as well as the puzzle pieces are all made of thick cardboard with a nice linen feel to it. I get a bit of an Arkham Horror feel from them but the puzzle is strictly X-Files all the way. The evidence bag is really nice and well made. Honestly, there isn’t a piece in this box that doesn’t look or feel amazing. The theme is completely integrated in everything that comes with the game. I love it and I applaud IDW for what they were able to accomplish. The rulebook looks like someone just handed you a case book from the X-Files itself. There is a lot of amazing looking artwork and tons of great game pictures everywhere. I especially like the couple of great looking art pieces on the last few pages of the book. These were no doubt taken from comic book covers for the X-Files comics by IDW. Everything is laid out and explained really well. There is nothing that is too difficult to understand. Just like the game itself, the theme is prevalent throughout the book as well. This is how a rulebook should be designed. It is one of the best looking books that I’ve ever seen for a game. Completely awesome from cover to cover. This is truly an awesome game. It has a great deduction based feel to it. As the Agent players are working to uncover clues, the Syndicate player is trying to cover them up. I really love how there is such a great balance as things will go back and forth between both sides. It reminds me of games like Arkham Horror, Clue, Last Night on Earth and Mr. Jack. I love that the Syndicate player has cards that do absolutely nothing. They are simply a red herring to make the Agent players a little nervous about what might be waiting for them at a specific location. I really get a good feeling of the TV show when playing the game. I really like that there is a definite division of what Agents and the Syndicate player can do and how each one affects the other. I also like that the more people that are playing, the harder it is for the Agents to buy puzzle pieces. The game plays in about an hour and a half which feel just right. I absolutely adore this game and love everything about it. The X-Files is a medium weight game of deduction based adventure. It can be played in about an hour and a half. The theme is prevalent throughout every piece of this game and is deeply ingrained in the X-Files TV show and comics universe. The artwork is truly amazing is ripped right out of the IDW comics. The game is really fun for both Agent and Syndicate players. Fans of games like Arkham Horror, Last Night on Earth, Mr. Jack and even Clue should enjoy playing this one. It’s a great deduction style game that will enthrall both fans of the show as well as the comics. It’s even fun for non-fans as well. The game is great. I highly recommend it. Once you play it, you will BELIEVE! For more information about this and other great games, please check out IDW Games at their site. This entry was posted in Reviews and tagged board, board games, card, card games, files, games, idw, idw games, kevin, kevin wilson, the x-files, wilson, x, x-files. Bookmark the permalink.